In today’s digital world, smartphones have replaced desktop computers. People prefer conducting their searches and online browsing on their phones or tablets. The world is getting more and more mobile friendly, smartphones have completely overtaken the web, forcing search engines to step up the importance and need for mobile optimization. In March 2018, Google had announced that they’re working towards migrating the websites to mobile-first index. Which means that the mobile version of your website will be used as a benchmark for indexing and determining the ranking of your pages. This step has made the need for a mobile-friendly website even more significant. Mobile-first indexing will reward good search rankings to only those websites which have made mobile optimization their priority. Which means if your website is not mobile optimized, your traffic will be affected. 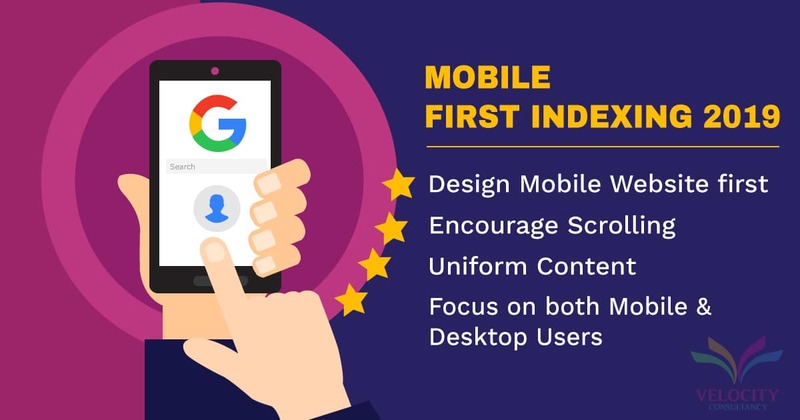 With the introduction of mobile-first indexing, first Google will crawl each company’s mobile web pages to determine the search engine rankings, before it analyses the desktop web pages. This move is completely different from the olden days, when the desktop version of a website was considered as the primary version by Google. With the introduction of Mobile First Indexing, no website can avoid optimizing their mobile website, to remain strong in the competition. With this movement, Google is inspiring website owners to make mobile optimized websites. If your website is not optimized or responsive it will still be a part of the Google’s index. In absence of mobile websites, Google will not stop crawling desktop versions, however your rankings will take a hit for sure. If your desktop version and mobile website have separate URLs, then the users can select the URLs according to where they plan to open the website. However the content on the mobile website, determines the overall ranking of the website. Encourage scrolling : In mobile designs, try including the text content above the fold. This encourages scrolling, as it show people that there is more to see on the page below. Focus on both Mobile and Desktop users : The introduction of mobile indexing first, does not make desktop unimportant. Both the mobile and desktop users are equally important and their goals and requirements are also becoming similar. Hence while designing the website, keep in mind the requirements of both the users. Uniform Content : Building a responsive website makes things easier, and the idea is to make sure the content is uniform across all the versions of the website. It is very important that the information posted on both the versions match. Design Mobile Website first : To ensure you develop a good design, it is needed that you design your mobile website first, before building the desktop version. If you build the desktop version first, there are high chances that you will find issues arising while creating the mobile version. This will increase your work and also be a huge wastage of time. We at Velocity Consultancy, can handle each and every step of website development from start to finish. Are you looking for website design which is mobile friendly? We can make it for you. Are you looking for a responsive website design? We can get it done for you. Previous PostPrevious What is call to action? Does your website needs call to action?